Unknown to Sylvie & myself this photo was taken of us at the St Thomas Festival a week ago today. It captures of day well, we have a queue!!! That happened a lot. 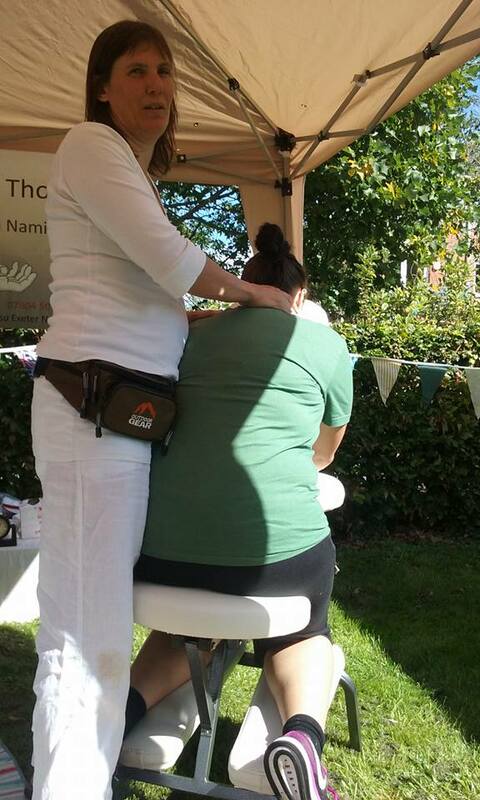 It also shows the beautiful sun shining in on us whilst we gave Shiatsu to lots of lovely Exeter folk. Thanks to St Thomas Community Festival for another great year & a great photo too! 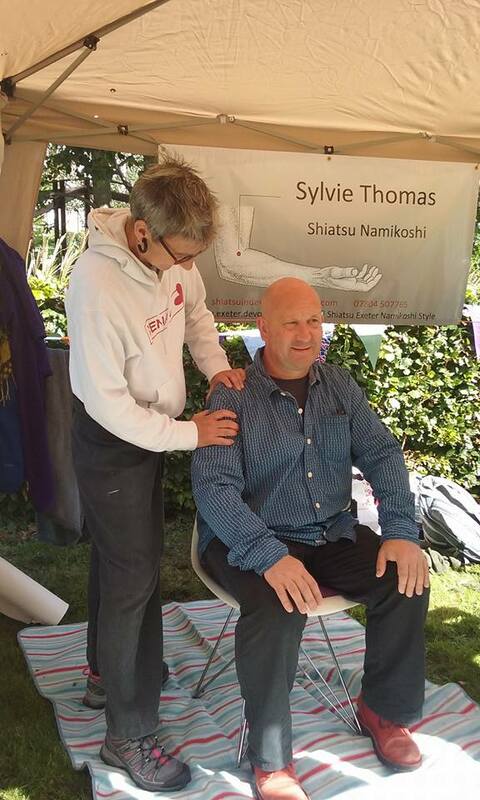 This weekend Sylvie & myself were giving Shiatsu at the 3rd St Thomas Festival. 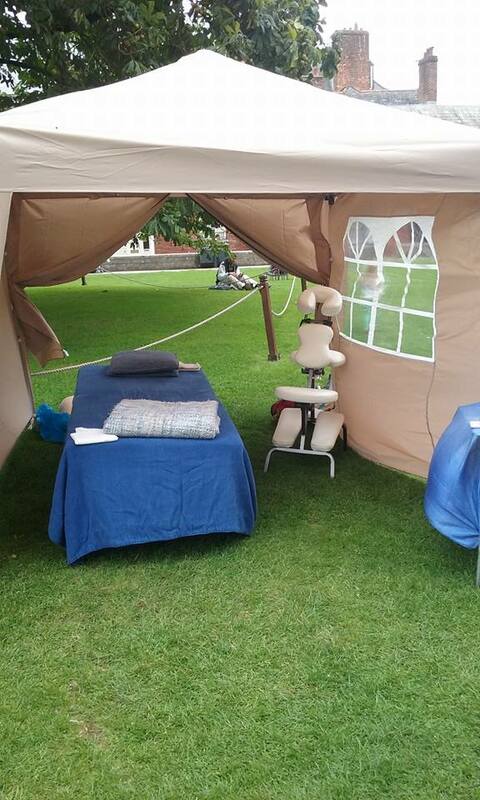 The weather was in our side & the sun shone into the gazebo & the people receiving Shiatsu. 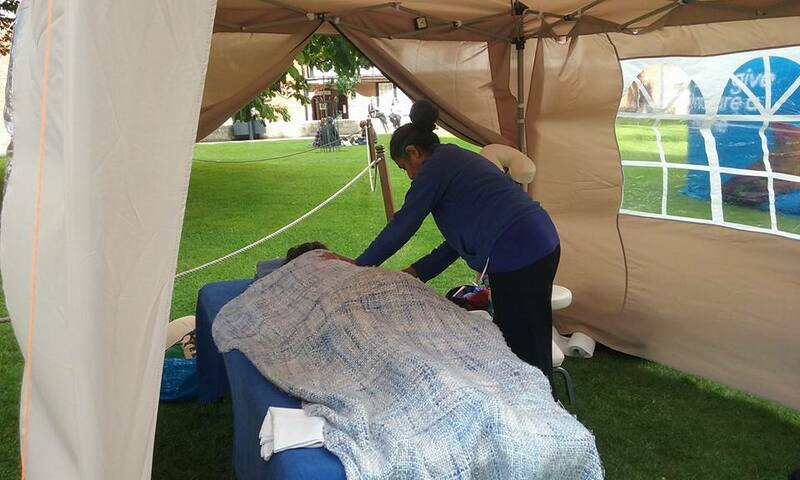 It was really lovely giving Shiatsu to old friends, people who had been at the festival two years ago & people new to Shiatsu. After a slow start we were both kept busy & we had a really enjoyable day. I even managed to get some photos taken for us whilst the sun was out & we were both working! 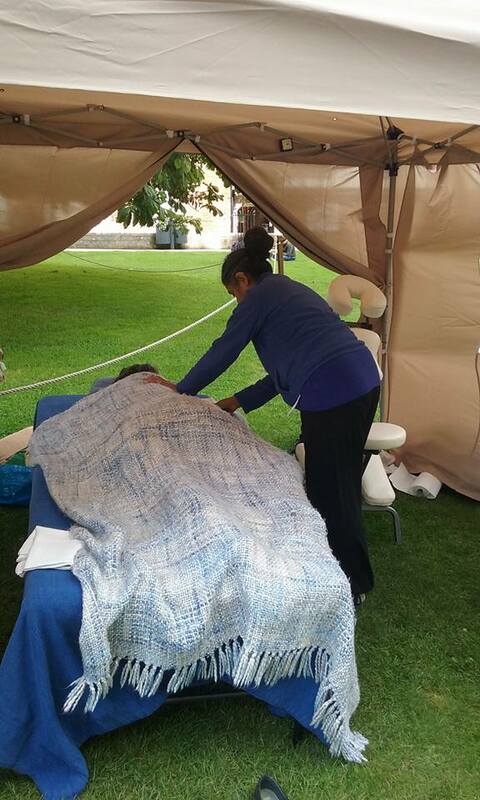 Sandhya & myself had a great time giving Shiatsu’s at the Exeter Green Fair last weekend. 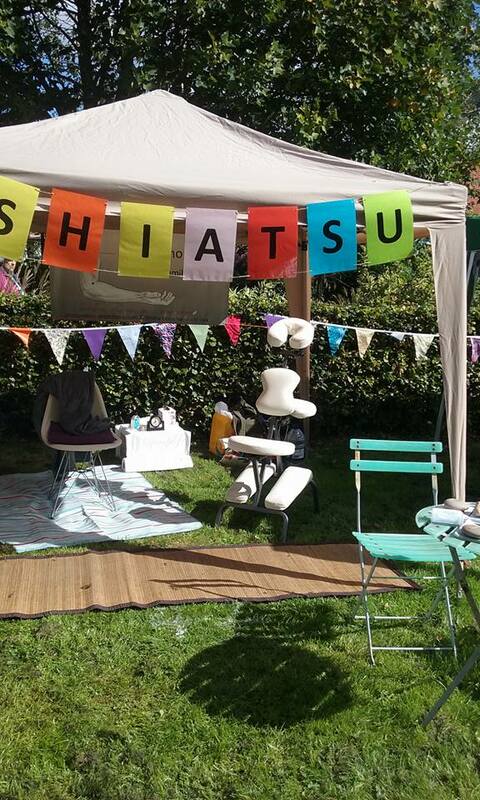 We managed to give enough Shiatsu’s to raise £150! This is going to go to Shelterbox Nepal. 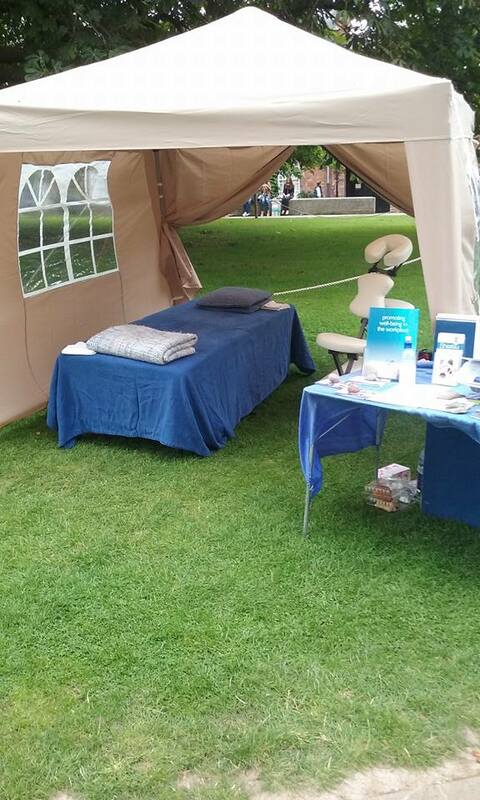 Apart from it being a very windy day, at the beginning of the day the Gazebo felt more like a kite than a safe haven to give Shiatsu. After getting a few more guy ropes we began giving Shiatsu and continued to pretty much non stop all day. 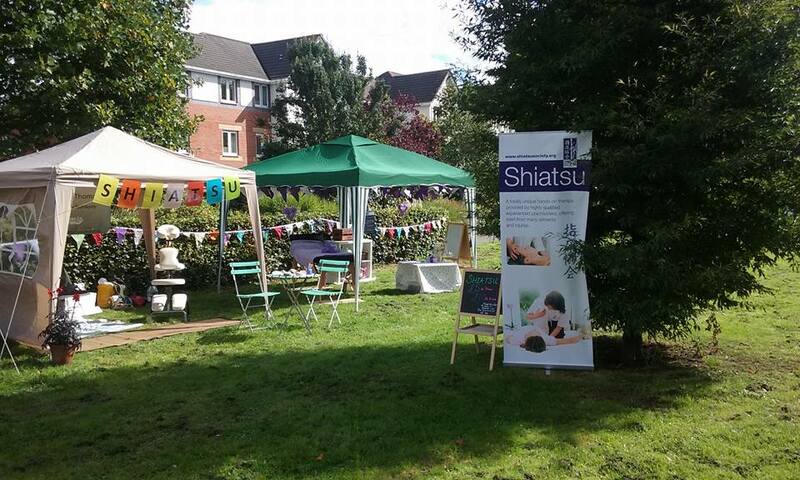 We had a really enjoyable day giving & promoting Shiatsu. I managed to take some photo’s right at the end of the day, once the sun had gone, but at least I got a few! 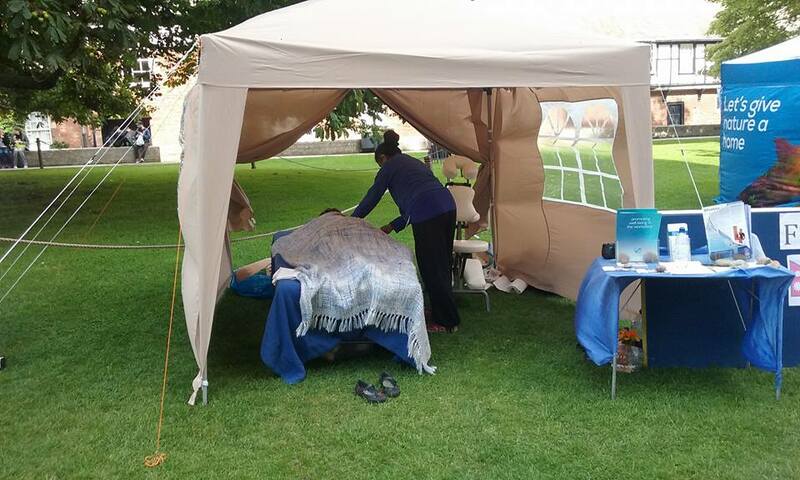 Just had a look at the weather forecast for Exeter for tomorrow – it’s looking pretty good for coming & having a Shiatsu with Sandhya or me at the Exeter Green Fair. It’s on at the Cathedral Green from 11 – 4. 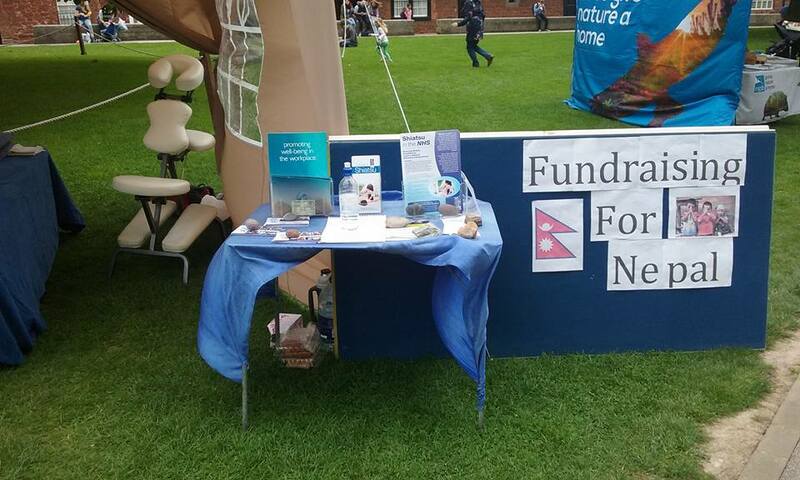 All the money we make will go to Shelterbox Nepal & The Green Party. 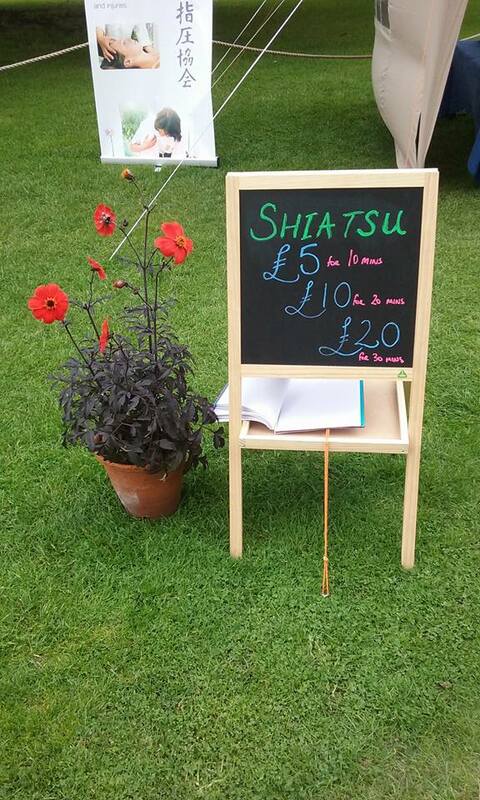 We will be charging just £5, £10 or £20 for a Shiatsu so affordable & for a good cause!! See you there! 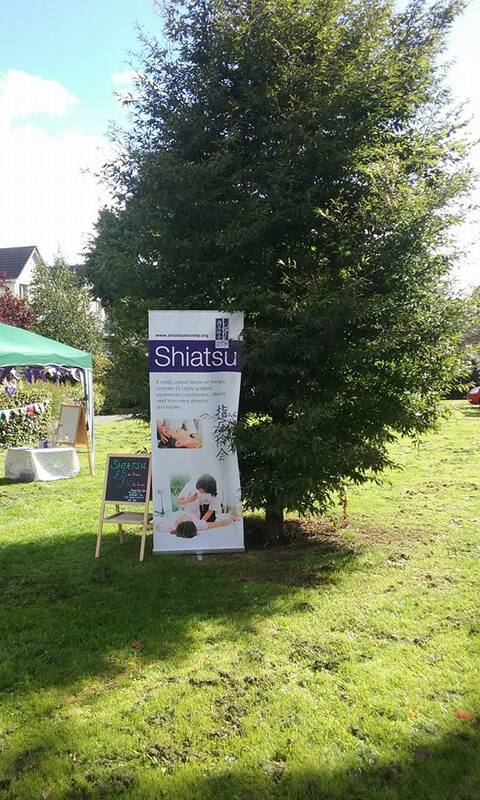 Just a couple of days before you can come & have a Shiatsu with myself or Sandhya Dave at the Exeter Green Fair. It is on the Catherdral Green between 11 & 4 this Saturday. 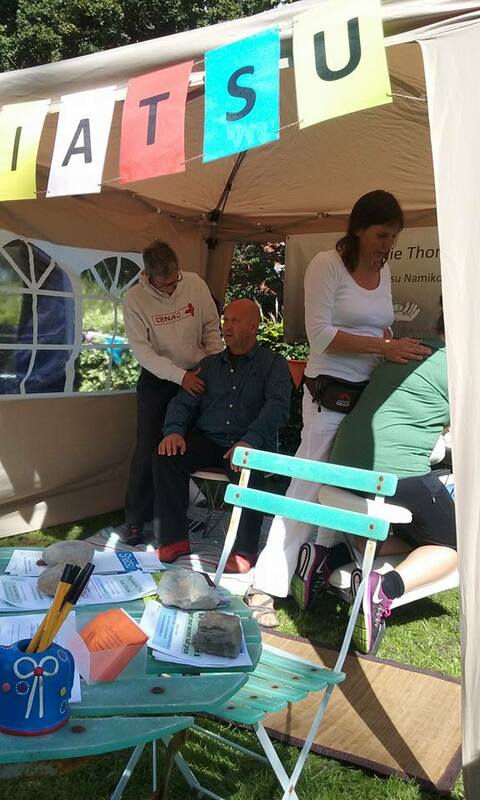 It’s a chance to have a Shiatsu, for not a lot of money – £5, £10 or £20 – & all the money we raise is going to charity – 50% to Shelterbox Nepal & 50% to The Green Party. 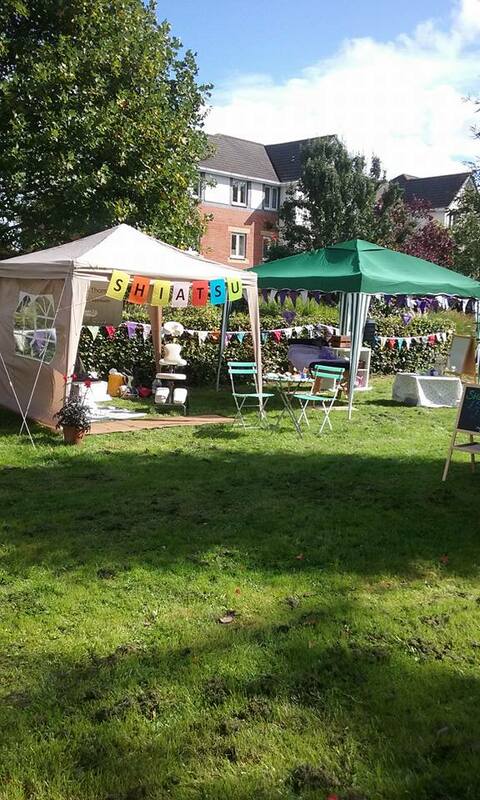 The Exeter Green Fair is a well established event with absolutely loads of interesting businesses, projects & charities that share an commitment to supporting the world around us. It is well worth a trip & there’s enough to occupy the whole family for a considerable amount of time. 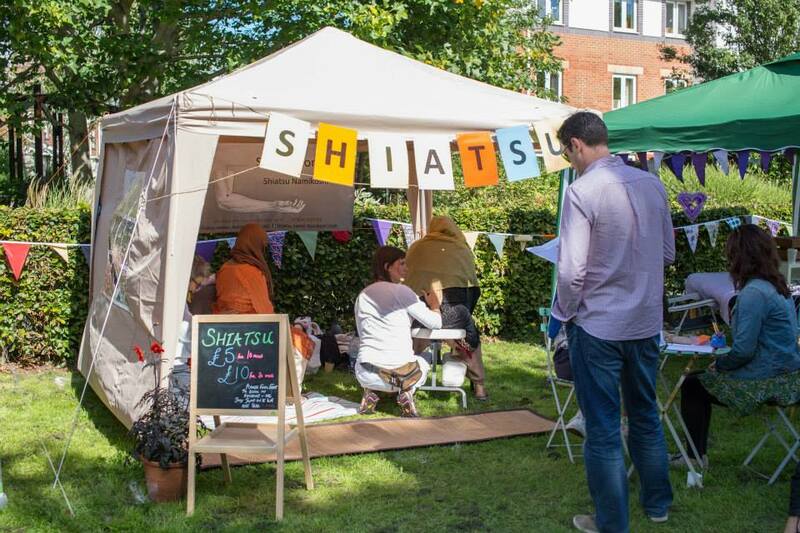 Whilst everyone is busy looking around you can come & relax & have a Shiatsu treatment, knowing it should do you some good & that the money you have spent will be doing some good for others. Hope to see you there.